It’s Pastor Appreciation Month! This is a great time to teach children about the role of the pastor and the importance of showing gratitude. If you don’t have anything planned for tomorrow, don’t worry! We’ve got your covered; simply print out these 2 reproducible activity sheets for kids that celebrate pastors and show them how much you appreciate them. You can easily add them to the beginning or end of your lesson. Imagine how blessed your pastor(s) will feel when they receive caring messages from your kids! Please help us celebrate Pastor’s Appreciation Day by sharing these printable activities with the other kids leaders, parents, or even grandparent you know! An example sent to us by a fan! What a lucky pastor, huh?! Surprise Showroom ‐ Ask permission to hang the kids’ artwork all over your pastor’s office. Blessing Book ‐ Bind the kids’ artwork into an encouragement book that your pastor can use throughout the year! (You can simply hole-punch the kids artwork and place them in a 3-ring binder. Special Delivery— Have the pastor visit your class and have the kids hand deliver their artwork. Hint: Have your kids include their ages on their letters. You can even have the kids flip their activities sheets over and trace their hands. It’s a visual way of showing how the littlest ones in the church appreciate their pastors. 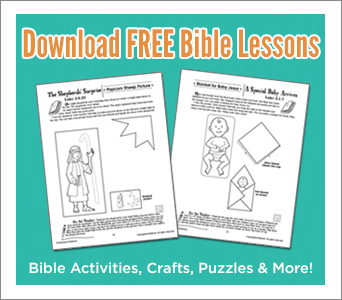 These are just 2 activities from RoseKidz’s Instant Bible Lesson: Bible Truths (Ages: 5-10), a reproducible book packed with flexible, all-inclusive lessons and over 60 hands-on activities. Click here to learn more about Instant Bible Lessons.